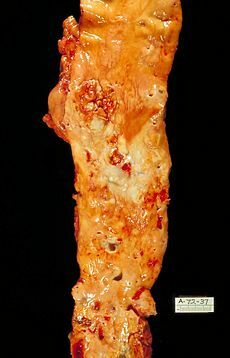 Severe atherosclerosis of the aorta. Autopsy specimen. Cardiovascular disease is a general category used for grouping diseases that involve the heart and blood vessels. Included under this designation are such diverse medical conditions as heart attack (myocardial infarction), stroke, coronary heart disease, cerebrovascular disease, atherosclerosis, hypertension, arrhythmia, and rheumatic heart disease. Cardiovascular disease is a major cause of death. In the United States, about 40 percent of all deaths in 1997, or about one million people, were attributed to cardiovascular disease (Friedewald 2002). It is one of two major causes of deaths, the other being cancer. Cardiovascular disease also has major economic costs, with an estimated direct health expenditure of $186 billion in 2000 in the United States, and an indirect cost of $190 billion. While some risk factors cannot be modified (genetics, age, gender), there are a number of risk factors that can be addressed through lifestyle changes or medically. These controllable risk factors include cigarette smoking, high blood pressure, obesity, diabetes, physical inactivity, and high blood cholesterol level. Taking personal responsibility to address these risk factors also can be beneficial for good health in general. The heart and blood vessels are part of what is known as the circulatory system or cardiovascular system. Blood vessels include arteries (including threadlike arterioles) that convey blood away from the heart, veins (including threadlike venules) that convey blood toward the heart, and the tiny capillaries that connect arterioles and venules. Cardiovascular disease is a term used to group any of the separate ailments that affect these parts of the body. There are many conditions that are included under the grouping of cardiovascular disease. Two of the most important are coronary heart disease and cerebrovascular disease. Coronary heart disease (or coronary disease) refers to the failure of coronary circulation to supply adequate circulation to cardiac muscle and surrounding tissue. Cerebrovascular disease is a group of brain dysfunctions related to disease of blood vessels supplying the brain. In the United States, these two diseases account for much of the deaths from cardiovascular disease. Of the nearly one million people who died from cardiovascular disease in 1998, 460,390 died of coronary heart disease and 158,060 died of cerebrovascular disease (Friedewald 2002). Coronary heart disease itself encompasses such conditions as acute myocardial infarction (heart attack) and angina pectoris. A myocardial infarction, or heart attack, is a condition when the blood supply to part of the heart is interrupted. This is most commonly due to occlusion (blockage) of a coronary artery. Heart attacks are the leading cause of death for both men and women all over the world (WHO 2004). Angina pectoris, known as angina, is severe chest pain due to ischemia (a lack of blood and hence oxygen supply) of the heart muscle, generally due to obstruction or spasm of the coronary arteries (the heart's blood vessels). Other major medical conditions generally included as cardiovascular disease include stroke, hypertension, hypotension, arrhythmia, congenital heart disease, and rheumatic heart disease. There is overlap, as some conditions are causal or risk factors for other conditions. While the term cardiovascular disease technically refers to any disease that affects the cardiovascular system, it is often used to refer to those related to atherosclerosis (arterial disease). These conditions have similar causes, mechanisms, and treatments. In practice, cardiovascular disease is treated by cardiologists, thoracic surgeons, vascular surgeons, neurologists, and interventional radiologists, depending on the organ system that is being treated. There is considerable overlap in the specialties, and it is common for certain procedures to be performed by different types of specialists in the same hospital. Most Western countries face high rates of cardiovascular disease. Each year, heart disease kills more Americans than cancer (CDC 1999). Diseases of the heart alone caused 30 percent of all deaths, with other diseases of the cardiovascular system causing substantial further death and disability. Cardiovascular disease was not always among the leading causes of death in the United States, with the list being headed in 1900 by (1) pneumonia and influenza; (2) tuberculosis; and (3) diarrhea, enteritis, and ulceration of the intestines, with diseases of the heart fourth and intracranial lesions of vascular origin fifth (Friedewald 2002). But by 1940, diseases of the heart and cancer were dominant among the causes, with an epidemic of cardiovascular disease, and especially coronary heart disease (Friedewald 2002). Deaths from coronary heart disease have progressively and steadily declined since 1963 in the United States (Friedewald 2002). Up until the year 2005, cardiovascular disease was the number one cause of death and disability in the United States and most European countries. A large histological study (PDAY) showed vascular injury accumulates from adolescence, making primary prevention efforts necessary from childhood (Rainwater et al. 1999; Mcgill et al. 2000). By the time that heart problems are detected, the underlying cause (atherosclerosis) is usually quite advanced, having progressed for decades. There is therefore increased emphasis on preventing atherosclerosis by modifying risk factors, such as healthy eating, exercise, and avoidance of smoking. Attempts to prevent cardiovascular disease are more effective when they remove and prevent causes, and they often take the form of modifying risk factors. Some risk factors, such as gender, age, and family history, cannot be modified or controlled. However, many can be modified, either through life style changes or medicine. Among major risk factors that can be addressed are cigarette smoking, high blood pressure, obesity, diabetes, physical inactivity, and high-blood cholesterol level (Friedewald 2002). In the United States, an estimated 50 million people have high blood pressure, which means a level equal to or greater than 90 mmHG diastolic pressure or 140 mmHg systolic pressure (Friedewald 2002). Among those risk factors that can be modified through life style changes, one of the most effective and easily modifiable changes is smoking cessation (or abstinence). Another is eating habits. According to the American Heart Association, build up of plaque on the arteries (atherosclerosis), partly as a result of high fat diet (with the fat converted into (cholesterol), is a leading cause for cardiovascular diseases. Regular cardiovascular exercise (aerobic exercise) complements healthy eating habits. The combination of healthy diet and exercise is a means to improve serum cholesterol levels and reduce risks of cardiovascular diseases. If not reduced sufficiently, a physician may prescribe "cholesterol-lowering" drugs, such as the statins. These medications have additional protective benefits aside from their lipoprotein profile improvement. Aspirin may also be prescribed, as it has been shown to decrease the clot formation that may lead to myocardial infarctions and strokes; it is routinely prescribed for patients with one or more cardiovascular risk factors. One possible way to decrease risk of cardiovascular disease is keep your total cholesterol below 150. In the Framingham Heart Study, those with total cholesterol below 150 only very rarely got coronary heart disease. In addition to foods that reduce fat intake, other foods are believed to have benefit. Research has shown that a diet that includes dark chocolate, almonds, fish, wine, fruits, vegetables, and garlic can increase life expectancy and decrease your risk for cardiovascular disease (Franco et al. 2004). Eating oily fish at least twice a week may help reduce the risk of sudden death and arrhythmias. A 2005 review of 97 clinical trials noted that omega-3 fats gave lower risk ratios than did statins (Studer et al. 2005). Olive oil is said to have benefits. Studies of individual heart cells showed that fatty acids blocked excessive sodium and calcium currents in the heart, which could otherwise cause dangerous, unpredictable changes in its rhythm. A magnesium deficiency, or lower levels of magnesium, can contribute to heart disease and a healthy diet that contains adequate magnesium may prevent heart disease (AGS 2004). Magnesium can be used to enhance long term treatment, so it may be effective in long term prevention (Rosanoff and Seelig 2004). Excess calcium may contribute to a buildup of calcium in the veins. Excess calcium can cause a magnesium deficiency, and magnesium can reduce excess calcium. There is evidence from one large unblinded randomized controlled trial of more than 3000 patients that reducing the amount of sodium in the diet reduced the risk of cardiovascular events by more than 25 percent (Cook et al. 2007). This re-affirms evidence from the Intersalt study published in 1988, that high levels of dietary salt are harmful (Elliott et al. 1996); these results were at the time heavily disputed by the Salt Institute (the salt producers' trade organization) (Godlee 2007). Another study likewise cast doubt on the idea that a high salt intake was a risk factor. In the results of a study of 8,700 adults in the U.S. released in 2008 by the Albert Einstein College of Medicine of Yeshiva University, researchers found that the people studied who ranked in the 25 percent of the lower sodium intake in their diet were 80 percent more likely to die of cardiovascular disease than the 25 percent who had the higher intake of sodium in their diet (AECM 2008). This particular research implies that low sodium intake is also harmful. Many recent clinical research discuss the direct relation between poor oral hygiene and cardiovascular disease. Oral bacteria and periodontal disease may trigger inflammation in the coronary arteries and contribute to atherosclerosis (artery hardening and narrowing), and some bacteria may impact clot formation, increasing the risk of heart attack or cerebral stroke (AHA; UM 1999). Atherosclerosis is a process that develops over decades and is often silent until an acute event (heart attack) develops in later life. Population based studies of youth show that the precursors of heart disease start in adolescence. The process of atherosclerosis evolves over decades, and begins as early as childhood. The Pathobiological Determinants of Atherosclerosis in Youth Study demonstrated that intimal lesions appear in all the aortas and more than half of the right coronary arteries of youths aged 15–19 years. However, most adolescents are more concerned about other risks such as HIV, accidents, and cancer than cardiovascular disease (Vanhecke et al. 2006). This is extremely important considering that 1 in 3 people will die from complications attributable to atherosclerosis. In order to stem the tide of cardiovascular disease, primary prevention is needed. Primary prevention starts with education and awareness that cardiovascular disease poses the greatest threat and measures to prevent or reverse this disease must be taken. Treatment of cardiovascular disease depends on the specific form of the disease in each patient, but effective treatment always includes preventive lifestyle changes discussed above. Medications, such as blood pressure reducing medications, aspirin, and the statin cholesterol-lowering drugs may be helpful. In some circumstances, surgery or angioplasty may be warranted to reopen, repair, or replace damaged blood vessels. Agricultural Research Service (ARS), United States Department of Agriculture. 2004. Lack energy? Maybe it's your magnesium level. United States Department of Agriculture. Retrieved September 1, 2008. Albert Einstein College of Medicine (AECM) of Yeshiva University. New study casts further doubt on risk of death from higher salt intake. Yeshiva University. Retrieved September 1, 2008. American Heart Association (AHA). n.d. Oral hygiene and cardiovascular disease. American Heart Association. Retrieved September 1, 2008. Centers for Disease Control and Prevention (CDC). 1999. Chronic disease overview. United States Government. Retrieved September 1, 2008. Cook, N. R., J. A. Cutler, and E. Obarzanek, et al. 2007. Long term effects of dietary sodium reduction on cardiovascular disease outcomes: Observational follow-up of the trials of hypertension prevention (TOHP). Br Med J 334: 885. PMID 17449506. Retrieved September 1, 2008. Elliott, P., J. Stamler, R. Nichols, et al. 1996. Intersalt revisited: Further analyses of 24 hour sodium excretion and blood pressure within and across populations. Intersalt Cooperative Research Group. Br Med J 312(7041): 1249-53. PMID 8634612. Retrieved September 1, 2008. Franco, O. H., L. Bonneux, C. de Laet, E. W. Steyerberg, and J. Mackenbach. 2004. The Polymeal: A more natural, safer, and probably tastier (than the Polypill) strategy to reduce cardiovascular disease by more than 75%. BMJ 329: 1447–1450. PMID 15604180. Retrieved September 1, 2008. Friedewald, W. T. 2002. Cardiovascular diseases. In L. Breslow, Encyclopedia of Public Health. New York: Macmillan Reference USA/Gale Group Thomson Learning. ISBN 0028658884. Godlee, F. 2007. Editor's Choice: Time to talk salt. Br Med J 334(7599). Retrieved September 1, 2008. Maton, A., J. Hopkins, C. W. McLaughlin, S. Johnson, M. Quon Warner, D. LaHart, and J. D. Wright. 1993. Human Biology and Health. New Jersey: Englewood Cliffs. ISBN 0139811761. Mcgill, H. C., C. A. Mcmahan, A. W. Zieske, et al. 2000. Associations of coronary heart disease risk factors with the intermediate lesion of atherosclerosis in youth. The Pathobiological Determinants of Atherosclerosis in Youth (PDAY) Research Group. Arterioscler. Thromb. Vasc. Biol. 20: 1998–2004. Rainwater, D. L., C. A. McMahan, G. T. Malcom, W. D. Scheer, P. S. Roheim, H. C. McGill, and J. P. Strong. 1999. Lipid and apolipoprotein predictors of atherosclerosis in youth: Apolipoprotein concentrations do not materially improve prediction of arterial lesions in PDAY subjects. The PDAY Research Group. Arterioscler Thromb Vasc Biol. 19: 753-61. Rosanoff, A., and M. S. Seelig. 2004. Comparison of mechanism and functional effects of magnesium and statin pharmaceuticals. Journal of the American College of Nutrition 23(5): 501S–505S. Studer, M., M. Briel, B. Liemenstoll, T. R. Blass, and H. C. Bucher. 2005. Effect of different antilipidemic agents and diets on mortality: A systematic review. Arch. Intern. Med. 165(7): 725-730. University of Michigan (UM). 1999. Real connection between oral health and heart disease. University of Michigan News Service Jan. 22, 1999. Retrieved September 1, 2008. Vanhecke, T. E., W. M. Miller, B. A. Franklin, J. E. Weber, and P. A. McCullough. 2006. Awareness, knowledge, and perception of heart disease among adolescents. European Journal of Cardiovascular Prevention and Rehabilitation 13(5): 718-723. ISSN 1741-8267. Wang, T. J., P. Gona, M. G. Larson, G. H. Tofler, D. Levy, C. Newton-Cheh, P. F. Jacques, N. Rifai, J. Selhub, S. J. Robins, E. J. Benjamin, R. B. D'Agostino, and R. S. Vasan. 2006. Multiple biomarkers for the prediction of first major cardiovascular events and death. N. Engl. J. Med. 355(25): 2631–9. PMID 17182988. Retrieved September 1, 2008. World Health Organization (WHO). 2004. The World Health Report 2004: Changing History. World Health Organization. ISBN 924156265X. Retrieved September 12, 2008. This page was last modified on 12 September 2008, at 20:20.